A diver’s paradise of colorful soft coral, WWII artifacts, and wrecks. Chuuk, or “Truk Lagoon”, is the world’s #1 dive destination for wreck divers, with over 60 wrecks that can be accessed by both recreational and technical divers. Reef fans will be equally fascinated by the enormous amount of colorful soft and hard corals that cover Chuuk’s wrecks. 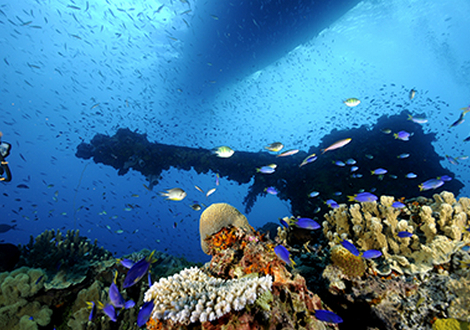 These incredible ship-shaped reefs are healthy and teeming with marine life. Most are easy dives and require only an Open Water certification. Advanced and tech diving are also readily available for those certified. United Airlines flies round trip to Chuuk four times a week. Mon/Wed/Fri mornings & Sun evening. Tue/Thu/Sat afternoons & Mon very early AM. Culture & Local Customs – Chuuk is very much a divers destination. A sheltered lagoon hiding a playground of colorful, ship-shaped reefs full of artifacts left behind from an historic WWII battle, Operation Hailstone. Above the surface, the lagoon is dotted with picturesque tropical islands. Although undeveloped, all of the islands in Chuuk are privately owned and making landfall requires special permission of the land’s owners. There are a few short land tours available, mostly to view old buildings and structures used in the war. All tours must be planned through your local tour operator. Non-divers can enjoy the lagoon by joining a dive boat as a rider/snorkeler. There are no shopping/tourist areas, souvenir shops, etc. beyond the grounds of your dive resort. Attire – Should you choose to venture beyond your dive resort please dress conservatively. Swimsuits/shorts shouldn’t be worn outside of the resort. Attire that covers the knees and shoulders is best. Swimwear is acceptable on the dive boat. Required for diving and all other water activities. Total $40.00, applicable to all travelers.